Disclaimer: Kohls provided me with Kohls gifts. No other compensation was received. Though the products were free, opinions are 100% my very own. Have you heard about the Kohl's Cares Program? When it comes to kids and education Kohl's really cares. We love highlighting companies that give back to the community and Kohl's just happens to be one of those companies. Kohl's sells kid friendly merchandise through the Kohl's Cares program, and donates 100% of the net profit to support children's health and education initiatives nationwide. The collections don't last long so you may want to go and gets yours ASAP. Mommy and I actually have a few of the books, with one of them being "The Cat in the Hat". This is such a great way to build your library and help out a great cause. 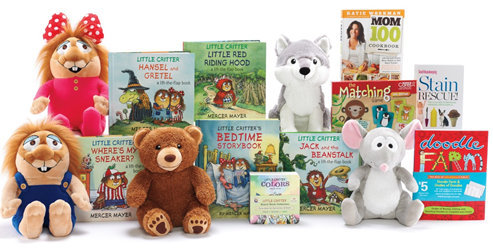 Get a jump start on back-to-school with the beloved Mercer Mayer storybooks, Little Critter, the newest Kohl’s Cares merchandise collection! Kohl’s Department Stores is offering exclusive merchandise from Mercer Mayer’s Little Critter for just $5 each, available now through September 20. 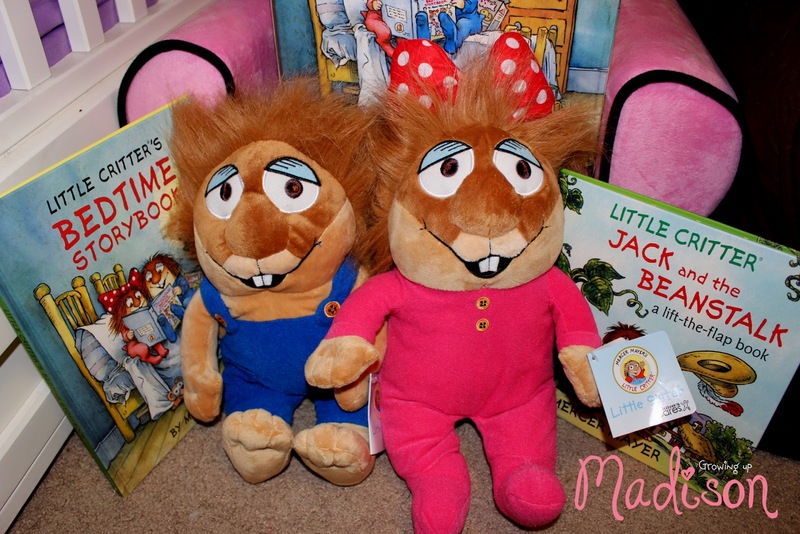 I received Little Critter and Little Sister and their books, Jack and the Beanstalk and the Bedtime Storybook. The Critters are perfect for my little hands and once they arrived I decided that they were going to sleep with me in my bed. There are no small parts for you to worry about so they are perfect for your little ones. Mommy and I enjoyed reading the books right before bed and the Little Critters makes the perfect friends for watching TV. At only $5 they make great gifts and remember you'll be helping out a great cause as well. How often do you get a book that costs $5 or even a plush animal? Whether you buy as a gift or for yourself you will enjoy the Mercer Mayer Little Critters Collection from Kohls Cares. This program gets my TWO TINY THUMBS UP! Kohl’s Cares, the philanthropic platform of Kohl’s Department Stores, is committed to giving back to the communities it serves by supporting kids' health and education nationwide, women's health and the fight against breast cancer, and environmental initiatives. Since 2000, Kohl's has raised more than $257 million for kids health and education initiatives through the Kohl's Cares cause merchandise program, recognized more than 19,500 outstanding kids through the Kohl's Cares Scholarship Program and donated more than 2.7 million hours of volunteer time through the Associates in Action volunteer program. I have said it before and will say it again. I love companies who give back. It shows that they really do care. 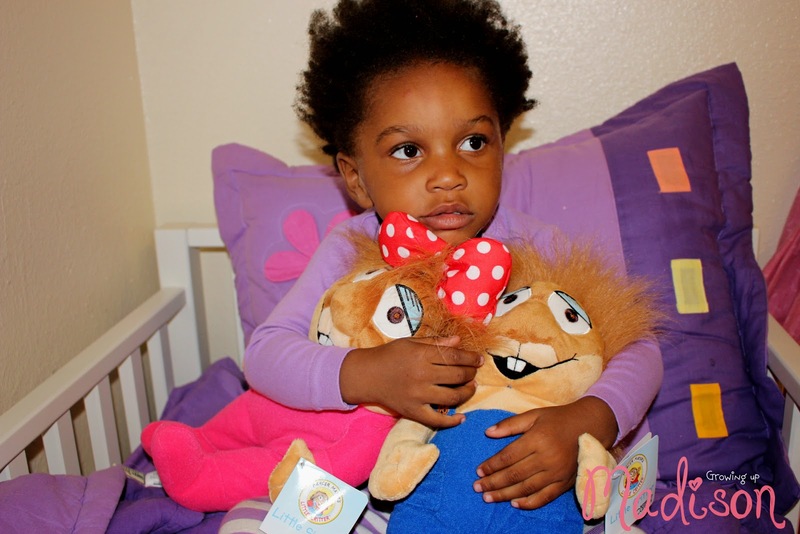 I think a child educations is extremely important and i love these books with the plush toys! I have to admit, I think i am gonna head out to Kohls soon and check everything out because this is awesome!! Thank you so much for sharing!!! 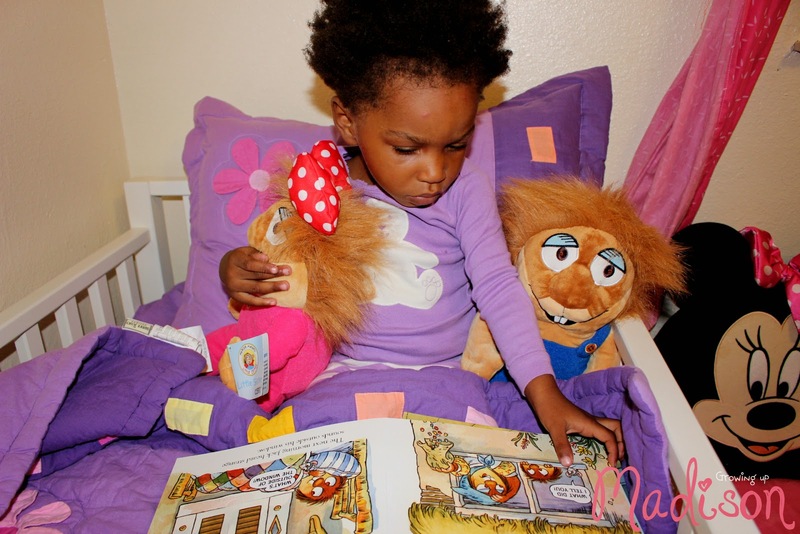 So sweet and such a great way to instill a lifelong love of reading in our little ones. Those stuffed animals would be a favorite too by my girls. I think my boys own every Kohl's Cares book & stuffed animal they have come out with in the last ten years. My mother can't stop herself from buying them. Those are so cute,I like the price also that is really cheap.Shame they do not have this over here I would buy my kids all of them. These are so cute! I love the matching plushies! It's a great way to encourage the young ones to read. Great job, Kohl's! Wow, that is really an awesome deal! You can't beat $5 each, and I love the wide variety of titles! This program is so great. And the stuffed animals and books are such a great price. It's a win-win for everyone. This is so cute. What a great way to encourage the little ones to read. The plushy is a great incentive. Those critters are so cute! I had no idea Kohls carried books. I dont get in to one very often as they are a bit of a drive. I didn't know Kohl's did something like that. I'm going to have to get the Wolf one for my niece and the bear one for my nephew now! Such a great program! We absolutely love Kohl's and have done a good portion of our back to school shopping there, so far! I love shopping at kohl's and this program is fantastic!! The little critters look so cute! I have seen the critters, but not the books. What a great idea and at a good price! The Kohl's Cares is a great program. I love shopping there. They have the best sales. I have a kohls gift card! I need to head up there to grab one of these books. I love Kohl's Cares program. Always fun stuff to buy and it goes to a great cause. Love this program. So great to see them doing it. Kohl's is one of my favorite stores. I love that they have the Kohl's Cares program, and they always have some great deals too. At these prices it's not a bad deal at all. $5 is a great way to help and I love that Kohls has this program. My nearest Kohls isn't too close by so I don't go there too often but with these prices I just may have to take a trip and get a few books and critters for my niece and nephews and help out a great cause as a bonus. Thank you for sharing this. I love this Kohl's program! I'll have to go in and get some of these books! I usually always walk out of Kohl's with one of their $5 books in the bag! I think they are such a good deal! This is a great program by Kohl's. I love shopping their for their great deals. These Little Critter books are too cute! I love the Kohl's Cares program. We received these too and the twins love them! Fun walk down memory lane for me and I love that the purchase helps others. I remember these from when I was little! I think I still have a few of those books somewhere! Ever so often, I would read or watch something that pertains to the States and I'd wish that I lived there. After reading this, that yearning once again came back to me. This is a great program by Kohl's. The plush characters are pretty good sized! I love these little programs Kohl's does! I remember reading those books as a child. I love the Kohls Cares books and stuffed toys. They are always so cute. The stuffed animals are so cute! My kids would love these. My kids love the Kohl's Care's products. They're soo adorable. I love the little critters products. I loved reading them to my first grade class. What great books and stuffed animals and at the perfect price! I need to get a few for my kiddos! Oh my goodness! I"m going to have to go. We love Little Critter! Those are cute little stuffed animals, Kohls always has great deals. My daughter is expecting in September, cannot wait to buy her baby toys. I love that Kohls has a program like this. The stuffed animals are super cute! We have a few of these too! Love the books and the characters that go with them!